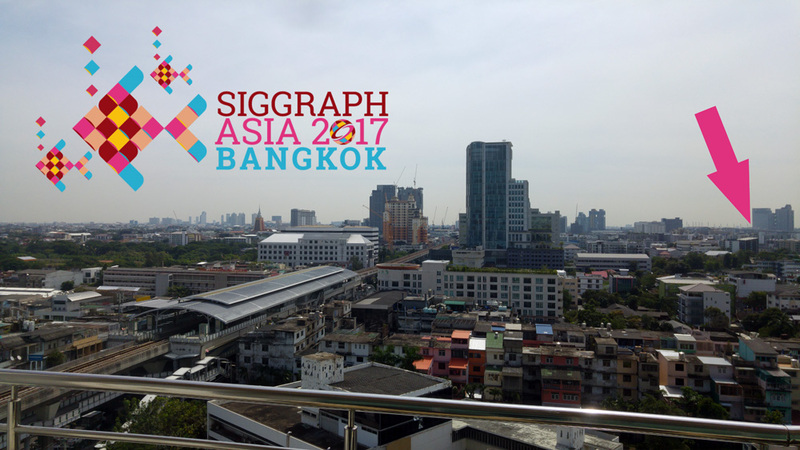 The SIGGRAPH Asia 2017 conference was held in Bangkok. It attracted many interested visitors from industry, education and other fields. The conference is mainly about rendering, graphics and animation. However, there is also a small Symposium on Visualization (SA17VIS). The three-day symposium is an opportunity for researches from visualization and more graphics intensive backgrounds to meet and exchange ideas. View from my hotel room on the 11th floor. The conference was held at BITEC, marked by the arrow. As a Visual Computing researcher within the SFB-TRR 161, I went there to present the results of joint work between the Transregio projects A01, that is trying to answer questions regarding Uncertainty Quantification and Analysis, and Transregio project B01 and IBM as external partner. Our paper on Visual Exploration of Mainframe Workloads showed how large amounts of performance data can be visualized with conventional infovis techniques. Our approach allowed domain experts from IBM to interactively analyze their data and demonstrated that parallel coordinates can be learned easily. Nils Rodrigues is a PhD student at the Visualization Research Center (VISUS) at the University of Stuttgart, currently working on the SFB-TRR 161 project B01 (Adaptive Self-Consistent Visualization). His research focuses on making visualizations consistent with the underlying source data.